Randow started playing the drums when he was 13 years old. Between the age of 14-17 he played in various cover bands. 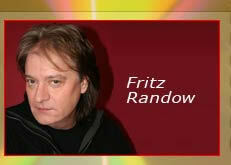 Fritz played in rock and heavy metal oriented bands such as Eloy, Victory, Sinner , Saxon , Epitaph in 2007 with Peter Panka's Jane. 3 more album were recorded between 1981-1984.